Sightseers, Ben Wheatley’s highly anticipated follow-up to Kill List, is a comedic character study starring Steve Oram and Alice Lowe as a freshly in love couple who are setting out on a road trip across the north of England, which turns into something unexpectedly darker and fatally dangerous for anyone who dares to spoil their twisted idyll. Pamela Jahn met up with the director at the 65th Cannes Film Festival in May to talk about exploring the British countryside, romance and how women are sometimes the better killers. Pamela Jahn: Sightseers is very extreme, like Down Terrace and Kill List, but feels more open and lighter. Ben Wheatley: Yeah, one of the major attractions to the story for me was to get out and explore some of the broader space of England, but also in terms of cinematic space… Sightseers is much more about figures and landscapes rather than just faces in frames. And there is more humour. Basically, I wanted to make a comedy after Kill List, because on the one hand, if I had made another horror film, everyone would have said I am a horror filmmaker forever and that would have been bad. The door would have just been shut and locked. We also felt depressed after Kill List, because it was just so horrible and it was such a hard film to make and to edit and to be involved in. And then you get this thing when you watch a film back, and you think, oh, well, I could have made anything, and I made this. Why did I do this? [laughs] So we thought, let’s just make something that feels lighter and happier, and more fun. And the other reason why we wanted to make this film is because we wanted to do something that is much more playful and loose. We knew that the movies coming up after this are going to be much more technical and difficult, so we wanted to be able to play a little more here. The violence is still pretty shocking in places. Yeah, but it’s not that shocking. Like Kill List wasn’t that violent, I mean not really. It’s just that you feel it because of the emotional kick, but physically and in terms of body count, it’s not that bad. The script was co-written by the stars of the film, Steve Oram and Alice Lowe. Does it still feel very close to you though? Amy Jump, who is credited with additional material, is my wife, and she co-wrote Kill List and edited on Sightseers as well. We restructured it a bit from their script and took things on board that we had learned from doing the two previous movies. So this way, we brought it into the family of the previous films. We also did the editing, and there is so much improvisation in it. There is actually a level of authorship that goes on top of the script, which comes purely from us. There’s a line that seems to run through your films, that somehow refers to the extreme, or the animalistic in human nature. What is it that fascinates you so much about that? Talking about England – but it’s the same in all of Europe, actually – it feels to me that there’ve always been layers of reality. Beneath the pavement is the earth, and there have been all sorts of things happening here for over thousands and thousands of years, and it’s all in us. And this is what we’re trying to show in these movies, that it is only a step to the left or the right and you find this stuff… Things aren’t as modern as we think. What is it that attracted you in particular to this couple and their story? When I first read the script and got to know the characters, what struck me was that they’re crossing over the boundaries of society, they’re not held back by modern manners. In a way, I could have been in the film, except I wouldn’t murder anyone, but I’d probably go back to the caravan, crunching my teeth, thinking ‘gggrrrrr’. And I think there is something about watching people who actually go through to the very end and break social rules and do it. But it’s also that kind of strange story about a couple who are throwing at each other what they like and what they don’t like. First, he shows her his darkest side, and then she can do it much better than he can, and that’s really depressing for him. So he’s crushed. I like that… For me that’s quite romantic. Are women the better killers? In this one, yeah, absolutely! But I don’t think she speaks for all women [laughs]. You don’t seem to be worried that people might take your films the wrong way and actually be inspired by them. It doesn’t end well for them, so I don’t know… And I made Kill List. Jesus, if I was worried about that, I would have stopped there. Did the success of Kill List come as a big surprise to you? Yes, it did. But I don’t know how you’re supposed to react when that happens. You can’t really think about it, because it just chains you from doing anything else. And you can’t take any of it seriously, because if you did, you’d take yourself too seriously and that’s a disaster – it totally inhibits how you work. So I just say ‘thank you very much’ and move on. And although you can pretend that you’ve got a plan, you just end up making the films you make. This is the only way I know how to do things. In retrospect, you could look at the movies and probably slot them in and go, ‘oh it’s a bit like this and a bit like that’. But they’re never conceived like that. Do you feel there is something particularly British about your characters or your films? In Britain, it’s like everywhere, there are people who are very meek and there are people who are just really, really violent. You wouldn’t want to stagger around drunk on a Saturday night in a seaside town in Britain without your wits about you. And I guess there are still people shooting pheasants with shotguns somewhere, things like that. 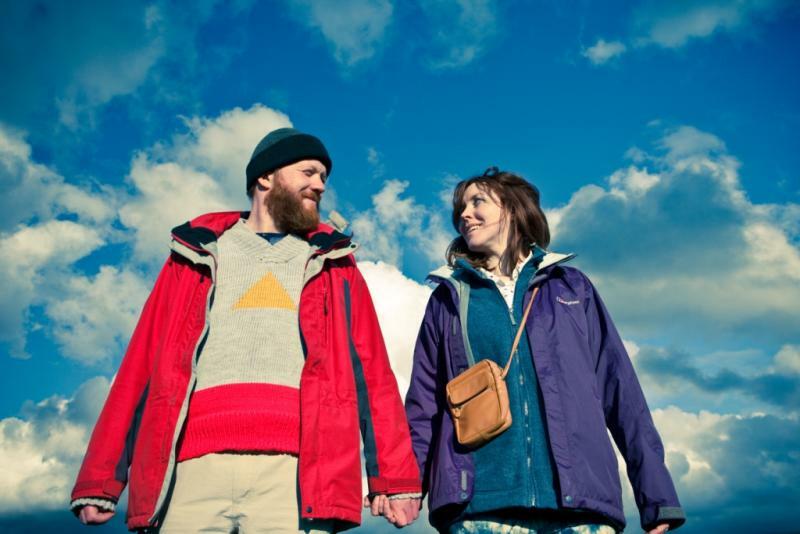 What’s your favourite killing scene in Sightseers? I really like Ian’s death, mainly because I like the parallel editing, you see lots of things happening at the same time, and cut to the music – I really enjoy those sequences. And we’re trying to make each of them different, but then use certain elements again for her murders and his murders. Is there something you think you consciously have to do, or not do, if you want to be a good director? I don’t know…But when I became an editor that ruined everything. So once you know how to edit, you’re fucked. Have you ever been on a caravan trip yourself? I have been camping a lot, but not in a caravan, no. And I don’t know if I will now, after sitting with a camera in the toilet of that caravan with a monitor on my lap. The caravan thing might be over for me.